Get your questions about healthy aging answered. Learn how to slow the march of time so that you feel younger than your “real age.” You can learn how to exercise and eat right so that you have a smaller chance of health problems. Also learn about emotional health as you age, and the benefits of staying social active throughout your senior years. Centers for Disease Control and Prevention, Health Aging: If you have questions about aging healthy, the CDC has answers. Learn about the most common concerns faced by those who are aging, and how to address them. Have your questions about exercise, diet, and disease answered by experts. All Things Aging: This great blog comes from the University of Indianapolis Center for Aging & Community. It features a number of interesting questions related to aging, and the answers. Also includes Q&A posts with various people. Get answers to your questions about healthy aging, and moving into retirement. 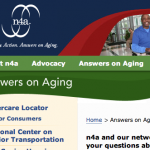 Answers on Aging: You can answers related to a number of questions about aging, including Medicare Part D, community support and more. 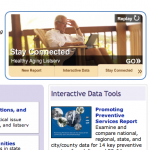 Find information about local centers about aging as well. WebMD, Health Aging: If you have questions about aging in a healthy manner, WebMD has answers. One of the best places to start is the Answers to 10 Questions About Healthy Aging. Learn more about what it takes to be healthy in your later years. Healthy aging: Get expert answers about aging in a healthy manner from the Mayo Clinic. This renowned medical facility offers plenty of information about living over 50, and about enjoying your retirement. You can get plenty of the basics, no matter what answers you are looking for. Older Adults and Mental Health: This useful information from National Institute of Mental Health offers answers to questions about mental health as you age. You can get information about depression, as well as about Alzheimer’s and other conditions that affect the mind. Great resources. Mental Health and Aging: Are you confused about the information out there regarding mental health as you age? The University of Missouri at Kansas City offers information about mental health and aging. It answers common questions about aging and mental health, and dispels some common myths. A valuable resource. Do you have questions about retirement? Whether you are about to retire yourself, or whether you plan to counsel someone looking for retirement help, there are a number of useful question and answer sites that can provide you with clues as to what to do next. Make sure that you are ready for the next stage of your life with help from these sites. 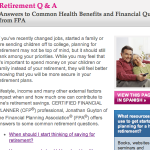 Plan for Your Health, Retirement Q & A: A great place to go if you are interested in how to financially plan for health costs during retirement. Offers a list of questions is offered, along with answers. If you are planning for retirement, this is a great resource that can help you navigate health care costs. Nearing Retirement: Q&A: This is a great resource that offers some in-depth information about what to do as you near retirement. Can you afford to retire? This question is answered by financial planners. Get what you need from The Business Review as you work to answer this question for yourself. Nursing Homes: If you are concerned about nursing homes during your retirement, you can get answers from Senior Living Today. Learn about services available, how to choose a home, and also learn about costs associated with care and different options. Find out more about care during retirement, and what to expect. A great resource that can help you find your way. Frequently Asked Questions about Retirement Benefits: Want to learn more about benefits in retirement? This site from the U.S. Office of Personnel Management has what you need to know. This Q & A site focuses specifically on questions of health benefits, retirement accounts, Social Security and more. A great place to visit when you want to know more about retirement benefits. Social Security Retirement Website Resources: This is a great list of common questions that come up when Social Security for the retired comes up. You can find out plenty about Social Security from The Social Security and Disability Resource Center. Learn more about when you can start drawing on Social Security benefits, find out about tax issues related to them, and find out when your benefits can be reduced. A helpful and informative site. Frequently Asked Medicare Questions: If you are interested in having your specific Medicare questions answered, this site can help. It includes common questions and their answers, and offers some additional resources. It’s a great starting place for those who want to make sure they learn about their benefits related to Medicare. A great help as you attempt to navigate the different parts to Medicare.